In 2005, Semir Osmanagich was convinced that he had made one of the biggest finds in archaeological history. 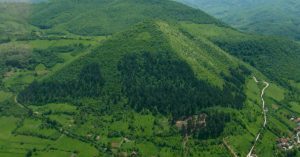 He claimed that some of the hills nearby the city of Visoko in Bosnia and Herzegovina were actually pyramids built by an unidentified ancient society (figure 1). If this was true, they would be the tallest step pyramids in the world, with the largest, dubbed the Pyramid of the Sun by Osmanagich, measuring 720 feet tall, which is about 240 feet taller than the Pyramid of Khufu, the largest pyramid in Egypt. He also believed them to be the oldest pyramids in the world, that they were built 12,000 years ago, meaning that they preceded the construction of the oldest Egyptian pyramid by over 8,000 years (Woodard 2009). Figure 1: A pyramidal hill located right outside the town of Visoko, thought of by many in Bosnia to be an ancient pyramid covered in earth and vegetation. Other than the shape of the hills resembling that of pyramids, Osmanagich had no clear archaeological evidence to back up his claim. The European Association of Archaeologists even called the pyramids “A cruel hoax on an unsuspecting public” and labeled his theory unscientific and all his findings either natural features or artifacts that came from the groups of people that have lived in the valley since the Greco-Roman period (Keats 2018). Osmanagich further discredited his own case by making farfetched speculations about the pyramids, like how they were made out of a concrete that is better than what is used today and how they allowed people to communicate via torsion fields while also improving their health and lengthening their lifespans (Keats 2018). Figure 2: One of the many shops in Visoko benefitting from the influx of tourists. Despite everything that was working against Omanagich’s conjectures, they were eagerly embraced by much of Bosnia, including many government officials, resulting in support of the theory being tied into Bosnian nationalism, with any skepticism branded as anti-Bosnian (Woodard 2009). This is not surprising, seeing as accepting this glamorous addition to the country’s history could be a convenient distraction from the relatively recent genocide that Bosnia is still recovering from; it was something people could be proud of. In addition to raising the country’s spirits, the pyramid theory also boosted the area’s economy. Tourists, including many from outside Bosnia, began flocking to the pyramidal hills, buying souvenirs (figure 2), taking tours of the area and even taking part in the excavations (Crosby 2017). The problem with all of this, other than feeding people claims not backed by science as the truth and benefiting monetarily from it, is that artifacts are being found by Osmanagich and his volunteer diggers. These artifacts, left behind by the various peoples that are known to have occupied the area, are having their contexts destroyed. Because of the untrained workforce and lack of documentation, Osmanagich’s attempts to prove his vision of the area’s history is erasing whatever the actual history is. 2017 Whether Real or a Hoax, Bosnian ‘Pyramids’ Bringing Concrete Benefits to Town. Radio Free Europe / Radio Liberty. https://www.rferl.org/a/bosnia-visoko-pyramids-osmanagic-economy-hoax/28725843.html, accessed December 1, 2018. 2018 Revisiting the Bosnian Pyramid Scheme. Discover. http://discovermagazine.com/2018/sep/pyramid-dreams, accessed December 1, 2018. 2009 The Mystery of Bosnia’s Ancient Pyramids. Smithsonian. https://www.smithsonianmag.com/history/the-mystery-of-bosnias-ancient-pyramids-148990462/, accessed December 1, 2018. 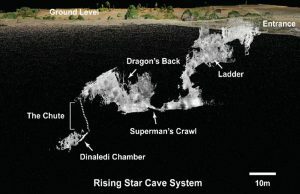 In 2013, a deep, at some points very narrow cave system called Rising Star in South Africa produced bones that would be identified as a new addition to the Homo genus, named Homo naledi. The over 1,500 bones found, belonging to at least 15 individuals of varying ages, shared many traits with ourselves, such as the structure of their hands, wrists and feet, while also having many stark differences, including a much smaller brain that is closer to the Homo habilis (Hendry 2018). This mix of primitive and more modern features is curious, by not that surprising by itself, considering how complex the family tree is and how different members of the genus evolved in different ways. The more surprising aspect of Homo naledi discovery is the age and location of the bones. To date the remains, the archaeologists who discovered the chamber first used radiometric dating on the flowstones, calcite deposited on the bones by running water that must have covered them at some point, and found that they were around 236,000 years old, meaning that the remains had to be older than that. After finding the minimum age, the team found the other end of the range by looking at how the cave’s natural radioactivity had affected the Homo naledi’s teeth by using electron spin resonance dating and estimated the maximum age to be around 335,000 years old (Greshko 2017). This dating makes the more primitive traits much more surprising because it means they were alive much closer to the time of Homo Sapiens than other members with similar brain sizes that lived millions of years ago (Figure 1), magnifying the complexity of the human’s already complicated evolution because it rejects the idea that brains have strictly gotten bigger and bigger as time has passed. 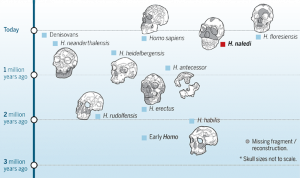 A timeline of the Homo genus based on the estimated first appearance of each member. The placement of the bones was also puzzling considering the cave to get to the two chambers that were found is almost impossible to traverse, the chute (Figure 2) getting as narrow as 18 centimeters wide. A cross section of the Rising Star cave system, showing the pathway that leads to the chamber that had most of the Homo naledi bones. This brings up the question of why these individuals were brought into the cave system. A lack of marks on the bones and animal bones suggests that they were not dragged into the cave by any other animal (Zhang 2017), their own kind had most likely moved them. This kind of treatment of the dead is strange behavior for creatures with their smaller brains. While other animals today acknowledge their dead, navigating a complicated cave system, and probably having to use fire to do so (Hendry 2018), suggests a higher level of cognition and culture. Greshko, Michael. “Naledi Fossils.” National Geographic, 9 May 2018, https://news.nationalgeographic.com/2017/05/homo-naledi-human-evolution-science/. Zhang, Sarah. 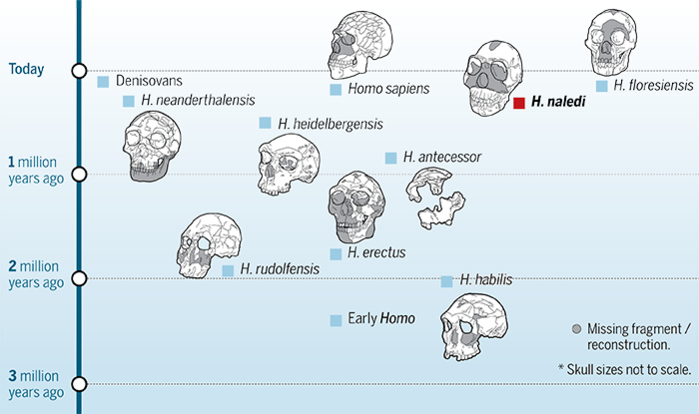 “A New Addition to the Human Family Tree is Surprisingly Young.” The Atlantic, 9 May 2017, https://www.theatlantic.com/science/archive/2017/05/homo-naledi-age/525825/.